(Photo credit: Esther Lin/Showtime) By Chris Williams: Superstar extraordinaire Floyd “Money” Mayweather Jr. (48-0, 26 KOs) feels that he’s already beaten all the top names in boxing at this point in his 19-year pro career, and he doesn’t feel like there’s anyone else for him to fight at this point in his career. Mayweather has beaten the big three – Manny Pacquiao, Saul “Canelo” Alvarez and Miguel Cotto – and Mayweather sees them as being the top fighters in the 147 and 154lb divisions. As far as Mayweather is concerned, he’s cleaned out both divisions and there’s no one else worthy for him to fight. While some boxing fans might say that Amir Khan, Kell Brook, Shawn Porter, Danny Garcia, and Keith Thurman deserve a shot at Mayweather, you can’t look at any of their recent fights and say that they all deserve a fight against Mayweather. All of them have either been arguably beaten, or they’ve been matched against weak opponents in order for them to get to this point. They haven’t faced the big names like Mayweather, and that’s why they don’t rate a fight against him. To get a fight against the king of the sport, you have to distinguish yourself in some way. In the case of Thurman, Brook, Porter, Garcia and Khan, they’ve extinguished themselves with their latest poor performances. “I think your biggest fighters in the sport of boxing is Canelo, right, Pacquiao, Cotto, and Mayweather, so if I beat them, I already beat all the top guys in the sport and I’ve been doing this from day one, so there’s no one else to fight,” Mayweather said to the media. It’s true that Mayweather has beaten the big three in the welterweight and junior middleweight divisions in defeating Cotto, Canelo and Pacquiao. Those three names are well and above the top welterweights and junior middleweights that are around today. Mayweather proved himself to be a great with those wins, and he now has officially cleaned up both divisions. If Khan, Thurman, Porter, Garcia and Brook want an audience with Mayweather, then they need to turn around and beat the big three [Pacquiao, Canelo and Cotto] like Mayweather did. Until they can run the table and beat those three fighters in back to back fights, I don’t see any of them as being worthy of a fight against Mayeather at this time. “What injury? You must be a comedian,” Mayweather said to one of the media members when asked about Pacquiao being injured in their May 2nd fight this year. “You look at the welterweight and junior middleweight divisions and the fighter that stands out alone is Floyd Mayweather Jr. I feel like I can choose who I want to fight. I don’t think they’re giving Berto any credit. This guy had his eyes closed [against Robert Guerrero] and he continued to fight. The guy can be knocked down and he’ll get back up and continue to fight. You can only judge Berto from his last fight. He did the same thing to [Josesito] Lopez that Canelo did. So you can only judge a man off his last performance. He gave 100 percent and the grade I gave him was an ‘A,’” Mayweather said. Yes, there is a lot of suspicion from the boxing public about Pacquiao’s shoulder injury. For some reason, a lot of fans think Pacquiao’s shoulder injury wasn’t legit. Mayweather appears to question it as well. He doesn’t buy the injury, and feels that it was just an excuse for Pacquiao to make to get out from owning up to the fact that he was out-boxed by Mayweather in their “Fight of the Century” last May at the MGM Grand in Las Vegas, Nevada. Berto did show a great deal of courage not only in his fight against Robert “The Ghost” Guerrero in fighting with two closed eyes from swelling, but also to fight with a torn shoulder in his fight against Jesus Soto Karass. Berto showed a ton of courage to fight for 10 rounds with a torn right shoulder in that fight. A lot of fighters would have quit on their stool in between rounds early in the fight, but not Berto. He stayed in there and was competitive for 12 rounds until getting stopped in the 12th round. Berto looked very impressive in his last fight in stopping Josesito Lopez. Berto did the same thing in stopping Lopez that Canelo did in stopping him. And that’s impressive. Berto is coming off of a sensational performance in beating Lopez. 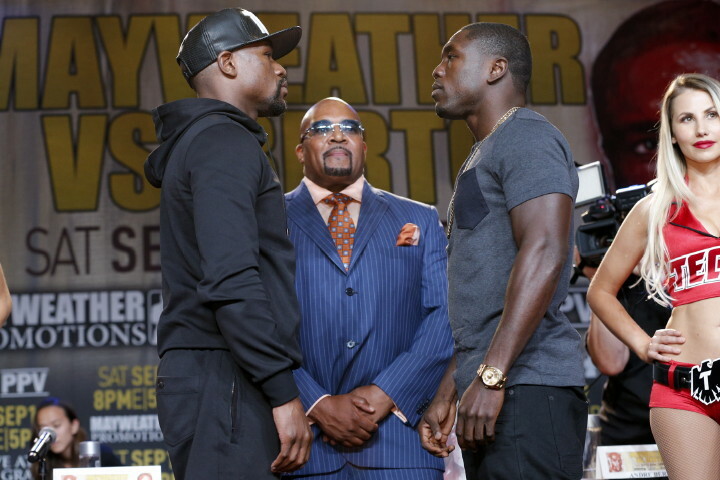 For that reason, Berto has earned the fight against Mayweather.